This article is a brief introduction of Copper. In this article, we will be do a recap of the differences between the four common types of copper data cabling. We have an extensive range of Cat3, Cat5e, Cat6, and Cat6a cabling and connectivity. To understand the differences between the cables, I have to give you a quick insight into Electromagnetics. This phenomenon is best described in the "coiled up power lead" scenario. For those who have done the Copper training you may remember some of this info. What is the "coiled up power lead" scenario? 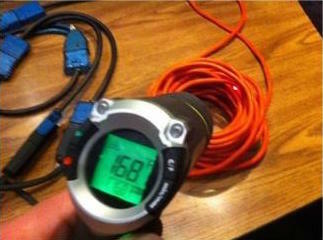 Below (pictured) is a power lead coiled up and in use (has current running through it). The temperature gauge is reading 168 degrees Fahrenheit (approximately 75 degrees Celsius). This can become a dangerous situation if the cable is not uncoiled as the heat can ignite fires. I’m sure most of you are familiar with this, but how does this relate to data? The same principles apply on a smaller scale to data cabling, and is the reason for so many categories of cable being on the market. This is because the power running through the cables creates an electromagnetic field around the cable. When this electromagnetic field comes into contact with another (depending on the direction) they either enhance each other or cancel each other out. If they cancel each other out, the residual is lost as heat. Hence the coiled power lead heats up. Two electromagnetic fields cancelling each other out in data terms is known as crosstalk. Crosstalk is the reason that Cat3, Cat5e, Cat6, and Cat6a are all different. As the categories have changed, the makeup of the cable has been designed to reduce crosstalk between the copper pairs and therefore increase bandwidth (speed). Cat3 differs from Cat5e, Cat6, and Cat6a because it is simply a group of copper pairs bundled into one cable. There is no physical shielding or separation in the cable besides the PVC coating on the copper pairs. As I described just before, this means the electromagnetic fields interfere with each other and create crosstalk. As the signal travels down the cable, it eventually gets to the point where the signal has fully cancelled itself out. That is why Category 3 cable is only suitable for voice systems. Its maximum bandwidth is 100mbs. This is slow compared to what is available today in other categories. It is still commonly used in telephone systems. Category 5e has seen success as being the first cable to effectively transmit 1gb (1000mbs - 10x faster than Cat3) across a 100m span. Its ability to do this came with a simple physical modification that saw a massive reduction in crosstalk. As you can see in the picture below, the copper pairs are twisted around each other. This slight change offsets the electromagnetic fields and reduces the cancelling-out effect that limited Cat3 to smaller bandwidths. Category 6 cable used the twisted pair idea in Cat5e and added a simple plastic spine that physically separates the pairs. This creates a physical barrier and separates the pairs. It also acts as a strength member for the cable. Again, this slight modification increased its data carrying abilities tenfold and allowed 10gbs (10,000mbs) to be achieved up to 55m. Cat6a (Category 6 augmented) is a strange beast. It comes in multiple flavours but the most common is what you see in the picture below. The gauge of the copper strand is slightly increased and the twist ratio of the pairs has also changed. The plastic spine in the centre is similar to the Cat6 cable. Most Cat6a comes as FTP which means 'Foil Over Twisted Pair'. Put simply, this is a foil shield that covers the whole cable and provides shielding from external interference. UTP (Unshielded Twisted Pair) is also available which comes without a foil shield. Cat6a allows bandwidths of 10gb up to 100m - twice as far as conventional Cat6 cable. As you can see, the basic differences between Cat3, Cat5e, Cat6, and Cat6a are very small. It is a simple, physical modification which helps reduce crosstalk. This allows larger bandwidths and in turn more information transferred without cancellation. The basic principle of sending a signal down a copper conductor hasn't changed.